Sarah Nader - snader@shawmedia.com Fritz Larsen, owner of Stuc's Pizza in McHenry takes a pizza out of the oven on Friday, May 4, 2012. Larsen also owns Halftime Bar & Grill in Johnsburg, Little Half Time Pizza in Richmond and is expanding his frozen pizza line which is on place to sell 115,000 pizzas this year. 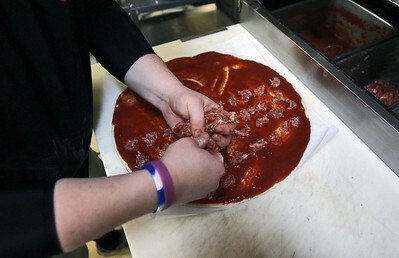 Sarah Nader - snader@shawmedia.com Assistant manager Jacob Carlson, 17, of Johnsburg prepares a sausage pizza for a customer while working at Stuc's Pizza in McHenry on Friday, May 4, 2012. 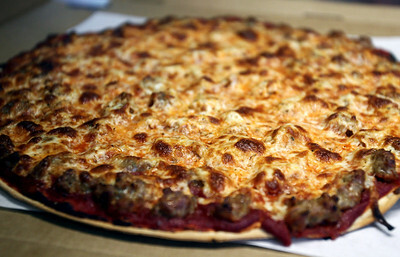 Sarah Nader - snader@shawmedia.com A sausage pizza gets boxed up at Stuc's Pizza in McHenry on Friday, May 4, 2012. 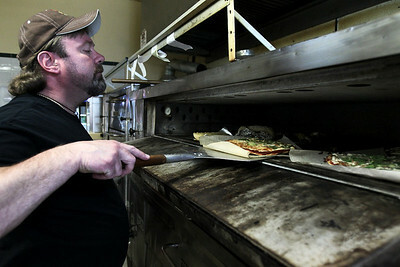 Fritz Larsen, owner of Stuc's Pizza in McHenry takes a pizza out of the oven on Friday, May 4, 2012. Larsen also owns Halftime Bar & Grill in Johnsburg, Little Half Time Pizza in Richmond and is expanding his frozen pizza line which is on place to sell 115,000 pizzas this year.